Auswalk has been guiding Kangaroo Island walking holidays for nearly 20 years, walking the island and parts of the trail that have subsequently morphed into the new Kangaroo Island Wilderness Trail. Our Kangaroo Island walking holidays combine these new magnificent sections of track, with our favourite old bits. Given that the island is the third largest in Australia, it has a lot to offer, but it can only be fully explored on foot. With over a quarter of the island’s area protected within national parks, it’s a paradise for walkers and naturalists. Tall limestone cliffs dominate the coastline and deeply incised creeks flow out to sea. As well as stunning stretches of coastal landscapes, are vast areas of wilderness and highly visible terrestrial and marine wildlife. Kelly Hill Caves, Remarkable Rocks, Admirals Arch and the 7000-strong colony of fur seals, frolicking on rocky platforms are some of the highlights of this outstanding walk. Every last detail is taken care of so you can fully experience this stunning island stress free. The meals are mostly chef prepared and include 2 course a la carte dinners. With two outstanding guides looking after you, you can pace yourself because we can offer a choice of easier or harder walking options along the way. Start at Adelaide airport at 9.30am (an earlier pick up is available from a CBD hotel at 09.00am). Travel via the scenic Onkaparinga area, McLaren Vale winery district and Fleurieu Peninsula to Cape Jervis. If conditions permit, there will be time for a short walk on the Heysen Trail or at the Deep Creek Conservation Park. Cruise by ferry over to Penneshaw on Kangaroo Island. This morning we’ll travel to the extreme eastern end of the island for a tour of the Cape Willoughby Lightstation. There are three historic lighthouses in all to explore on this walk, each with its own unique features and history. At Cape Willoughby, enjoy a walk through history and there may be an opportunity to climb to the top of the lighthouse. After that, we will travel to the mid-section of the island to Seal Bay where you’ll see Australian sea lions in their natural habitat. There are also populations of kangaroos, wallabies, possums, echidnas, goannas, penguins, koalas, Cape Barren geese, fur seals and platypus. The boardwalks and lookout offer great views over the coast. The afternoon’s walk features historic sites at Weirs Cove and a fur seal colony at Admirals Arch. 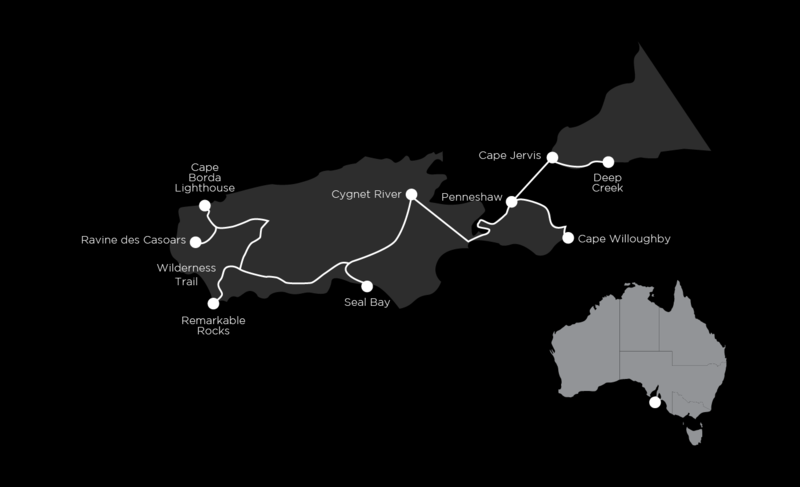 Today will will walk a section of the Kangaroo Island Wilderness Trail from Snake Lagoon all the way to Cape du Couedic. The walking is quite remote as we follow riverside tracks as they meander to the tumultuous ocean. This is a moody place with a real sense of isolation. The afternoon’s easier option is a circuit walk in the Rocky River area where there should be lots of wildlife and flora. Those lucky enough might even spot an elusive platypus in the stream. Today covers another section of the Kangaroo Island Wilderness Trail. We will walk from the Hakea Campsite at Cape du Couedic to Sanderson Bay heading toward Remarkable Rocks. The track enters dense coastal mallee country before breaking out to the awesome sight of the iconic Remarkable Rocks. The wind-sculptured Remarkable Rocks proudly sit on top of a huge granite dome – a testament to 500 million years of nature’s erosion. Today starts at remote Hanson Beach. The track meanders through a delightful bushland walk passing several lagoons teeming with bird life. After lunch, we’ll visit Kelly Hill Caves for a tour of the limestone caverns. Here you’ll see the most unusual helictites. In the afternoon, there will be an option of hiking back to Hanson Beach and continuing on along the cliff tops or enjoying a visit to Vivonne Beach, a stunning arc of white sand. There will be time for a stroll or a swim in the crystal clear waters. As well as walking you’ll visit Kelly Hill Caves and see ornate limestone formations, sinkholes, caverns and extensive chambers. These are no ordinary caves – you’ve no doubt seen stalagmites and stalactites, but have you ever seen helictites? Today we’ll head for the very remote Cape Borda region. The morning hiking will take the path used by early lighthouse keepers to transport supplies from the boat landing to the lightstation itself. Our finale will be a remote hike in the Ravine des Casoars Wilderness Area where you can explore some fascinating limestone caves. We also explore Cape Borda Lighthouse on the last walking day, a special square lighthouse that’s perched high above Investigator Strait, and was built in 1858 to guide sailing ships arriving off the ‘roaring forties’ trade routes. Travel back to Penneshaw and catch the ferry to the mainland. We will be stopping for lunch in the McLaren Vale wine region, before arriving back in Adelaide at around 4.00pm. Meals: Breakfast in retreat restaurant and lunch at a local winery/cafe. The tracks are well graded and mostly easy to negotiate. Full day walks average about 14km and are mostly flat or undulating. There is an opportunity for walkers to really challenge themselves on the full walking days. Comfort is always a priority, at the end of each day on these Kangaroo Island walking holidays a hot shower, glass of wine and an excellent two course meal awaits. A comfortable night’s sleep ensures you’ll wake refreshed and primed, ready for the next day’s walking after breakfast. The accommodation at Penneshaw is a good quality resort motel with ensuites. Conveniently located across from the beach overlooking Backstairs Passage. We then travel to the west side of the island and for the remainder of the trip stay at the Kangaroo Island Wilderness Retreat. This accommodation is nestled amongst the true wilderness of Kangaroo Island, and is adjacent to the Flinders Chase National Park. You will enjoy two course chef-prepared dinners at the retreats on-site restaurant, utilising fresh local produce. Packed lunches and picnics complete the circle ensuring that your appetite is always satisfied. In fact, you can look forward to having lunch on a daily basis at incredible locations on the island. A walkers lunch may include a high protein type salad, a roll or a wrap, a muesli bar, cake or muffin and a piece of fruit. Each day is slightly different. Lunch is always augmented by Auswalk’s famous trail mix. Importantly, you start each day with a substantial breakfast, four of them expertly prepared by professional chefs. This is a great way to ready yourself for the upcoming walk. Kangaroo Island has a burgeoning wine industry and is also well known for its marron and unique Ligurian honey. The tracks are dry, firm and well cared for on Kangaroo Island. Most of the walks are easy to moderate. The easy walks are great for first timers; however, the experienced hikers won’t be disappointed as there is ample opportunity to walk challenging distances and explore some fascinating geological sites. The new Kangaroo Island Wilderness Trail as you’d expect is extremely well cared for and makes for excellent walking. This trip operates with a pair of expert guides that lead the way, providing the flexibility to walk at a pace that suits you and offering a choice of easier or harder walking options along the way. We only depart at the best time and for Kangaroo Island this is autumn and spring. See the Bureau of Meteorology’s information about temperatures and rainfall ahead of time to ensure suitable clothing.